Increasingly, the economic and social benefits of broadband connectivity for development are becoming evident. On the economic side, the World Bank estimates that every 10% increase in broadband penetration can yield an increase of as much as 1.4% in GDP growth. It is clear as well that broadband Internet has even greater potential impact than voice connectivity alone. But the impacts of broadband are not merely economic. As recent events in the Middle East and North Africa demonstrate, the Internet, and broadband in particular, can be a power force for social change, fostering greater social inclusion, civic participation and political transparency, not to it is critical for delivery of improved education, healthcare, relief, and more. The debate among policymakers has now shifted from whether to promote broadband access to the question of how to do so most effectively. Just 9.6% of the total population in Africa has access to the Internet. This is less than 1/5th and 1/6th of the rate in the Americas and Europe, respectively. But this statistic does not convey the real situation in the world’s poorest countries. Of Africa’s 48 sub-­‐Saharan countries, 29 (60%) have total Internet usage rates (at any speed) of less than 3%, and 15 (31%) show less than 1%. Broadband access rates are far lower still. And the cost can be 100 or more times greater. Inveneo believes that closing the broadband gap will require new, collaborative and low-­cost broadband service delivery models. Moreover, we believe that the essential components of such a model already exist; what’s needed is a well – conceived and coordinated effort to bring them together in a functioning service delivery framework. 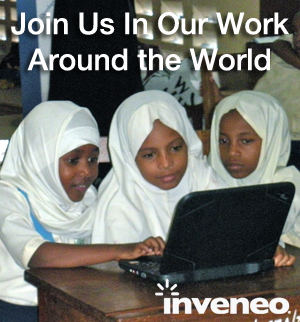 This is why Inveneo is leading Broadband for Good™, an innovative new approach to accelerating access in under-served areas around the world by partnering with global organizations and local service providers, building local entrepreneurial capacity and working and identifying radically lower cost connectivity designs to implement region specific demonstrations that can catalyze profitable models that service provider can adopt and scale. Under Broadband for Good, Inveneo is participating in, driving and in some cases partially funding demonstration projects in different regions around the world. These projects will be implemented over the next 3 years using a multi-stakeholder and regional approach. Also, using our Broadband for Good, Inveneo and our local partners can design project-specific rural networks/approaches for connecting schools, clinics, humanitarian agencies and other regionally disparate locations. These networks can enable better access to high quality broadband by extending broadband from regional cities and they can lower overall costs by connecting the locations to each other so they can communicate on their own network and then aggregate their purchase for Internet as one organization. If would want more information or would like to participate as a partner in Broadband for Good, please connect with us now.